Jezz Goldson-Williams during his debut for Peterborough Northern Star against Oadby. Photo: Tim Gates. Stamford AFC delivered a stunning display as they moved four points clear of the relegation zone in the Evo Stik Northern Premier League yesterday (March 5). The Daniels took full advantage of a raft of postponements in the division to ease their fears of the drop with a 5-2 duffing of Skelmersdale at the Zeeco Stadium. Craig Smith wins a header for Peterborough Northern Star against Oadby. Greg Smith converted two penalties with Jake Newman, Jordan Smith and Jake Duffy also on target. Newman struck in the first minute and, although the visitors soon equalised, Stamford were 3-1 up at the break before coasting home in the second-half. Peterborough Sports are now 15 points clear at the top of United Counties Division One after their Friday night (March 4) win over Oakham and the failure of second-placed ON Chenecks to beat Blackstones yesterday. Sports attracted a rare three-figure attendance (officially recorded at 111) for their 2-0 win. A Josh Moreman header and a neat finish from substitute Jordan Macleod late on secured what was a comfortable success. Blackstones showed great powers of recovery in their home game against promotion contenders. Chenecks led three times before settling for a 3-3 draw. The visitors took the lead for the third time in the 89th minute, but Matt Porter scrambled home his first goal for the club in added time to ensure Stones gained a deserved reward. Addie Staffiero had grabbed Stones first equaliser. while Ben Porter also scored his first goal for the club 20 minutes from time. Bourne are enjoying an outstanding season at this level and yesterday they showed no mercy to bottom club Burton Park Wanderers storming into a 4-0 lead after just 21 minutes before completing a 6-1 win at the Abbey Lawns. Teenager Zak Munton claimed a quickfire hat-trick during that early blitz to take his goals-tally for the season to an impressive 18. Max Cooper, direct from a corner, Tyler Sculthorpe and substitute Jack Humphries also scored for fifth-placed Bourne. Holbeach United still have an outside chance of the Premier Division title after securing a rare win at Cogenhoe. The Tigers had only previously won once in 12 trips to this venue, but player-assistant manager Andrew Tidswell’s hat-trick set them on the way to a resounding 5-1 success. Josh Ford and Jordan Thomas also netted as Holbeach stayed fourth. They are 13 points off top spot, but with three games in hand. 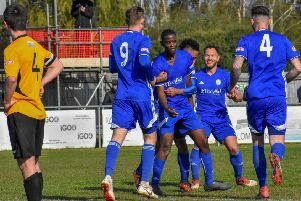 Leicester Nirvana are back on top although they struggled to a 2-1 home success against rock-bottom Huntingdon, a team they’d fired eight goals past a couple of weeks ago. Previous leaders AFC Kempston were the victims of a late postponement at Deeping Rangers. There was joy at last for Peterborough Northern Star who ended a run of 12 matches without a win in a high-scoring clash against Oadby at Chestnut Avenue. The city side fielded new signing Jezz Goldson-Williams - he has transferred from Deeping - and although he didn’t score, his team-mates rattled in four goals to edge a seven-goal thriller. Hayden Bream was on target twice, including a penalty, with Craig Smith and Chris Jones also scoring. Yaxley continued their good form with a 3-1 success at Harrowby. Phil Stebbing, Dan Cotton and Liam Hook all scored in an 11-minute second-half spell for the Cuckoos. Mercurial talent Dan Woods scored his first goal for March Town United following his return from Peterborough League side Pinchbeck United, but ‘The Hares’ let a 2-1 half-time lead slip as they crashed 5-2 by the seaside at second-placed Great Yarmouth in Division One of the Thurlow Nunn League. Postponed: Deeping Rangers v AFC Kempston Rovers, Wisbech Town v Kirby Muxloe.